Alfred Hitchcock said that the introduction of sound to cinema dealt the medium a terrible blow, taking it away from its purest form and changing it into one in which most films consisted of "photographs of people talking." This may be less true now than it was in Hitchcock's day, (though it's perhaps not completely untrue) but there was a period in which even the best filmmakers struggled to get to grips with making sound work effectively, and it would take years for the dynamism that characterised some of the later silent films to become the norm in sound cinema. All genres were hurt by the change, but comedy seemed to suffer more than most. Chaplin, Keaton and Lloyd, among others, had raised slapstick to a high art, but the really great ones knew that a well-timed edit or perfectly executed camera move could be as funny as any pratfall. Keaton even made Sherlock, Jr., a comedy film which was about the nature of film itself, and which used incredibly sophisticated editing to create jokes which would have been impossible in any other medium. Sound complicated that way of working; now characters had to say funny things as well as do funny things, but the technology meant that it was tough to do both. This gave rise to the screwball comedy, a genre which was heavy on dialogue and comparatively on physical gags. It was an art in its own right, certainly, but in its infancy it resulted in films like Frank Capra's Arsenic and Old Lace and Lewis Milestone's The Front Page; very funny films which were not only adapted from stage plays, but which looked like them as well. 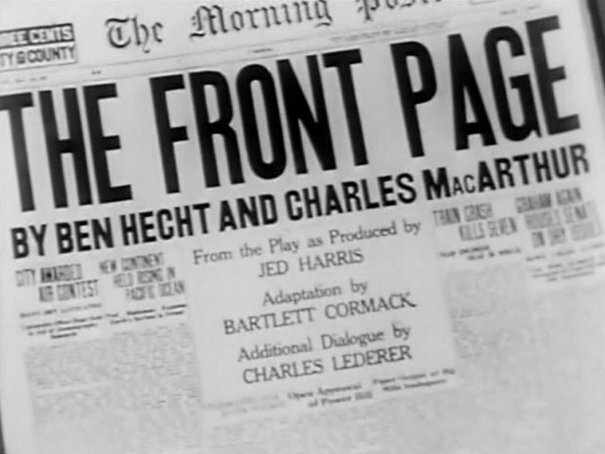 Based on the play of the same name by Ben Hecht and Charles MacArthur, The Front Page is a delirious farce in which a newspaper man named Hildy Johnson (Pat O'Brien) finds himself caught up in a whirlwind of deceit, corruption and roll-top desks. Hildy shows up at the Press Room of the Criminal Court's Building on the day that Earl Williams (George E. Stone), an alleged Communist accused of murdering a black policeman, is due to hang. Hildy is not there to report on the event, though, he's there to say goodbye; he's been offered a job in New York and is leaving without giving notice. He only shows up to say farewell to the men who he has shared many a game of poker and a morbid joke with over the years. Like John McClane (if he went around in a clean three-piece suit rather than a dirty vest), Hildy turns out to be in the wrong place at the wrong time. As he prepares to set out for his new life, news breaks that Williams has escaped. It's not long before he's found, though, because within minutes he drops through the window of the press room and pleads his innocence to Hildy. He becomes convinced that Williams is a patsy who has been screwed over by the Mayor to curry favour with black voters. It's a juicy story, one which has almost literally fallen into his lap. Intent on breaking the news before any of his rivals, or before the police find him, Hildy hides Williams in a roll-top desk and implores his conniving, ruthless editor Walter Burns (Adolphe Menjou) to help him. As I said earlier, there's not much inherently cinematic about The Front Page. There's a brief scene of men trying out the gallows which employs a moving camera and some moody lighting, but apart from that the rest of the film takes place almost solely within the confines of the Press Room as people with conflicting agendas rush in and out. This, as well as the unfussy staging, adds to the sense that the film is only a step above setting a camera up in a theatre and recording a performance; there are long, unbroken takes of people talking to each other at dizzying speeds, the camera and the actors move little if at all, and there is precious little sense of a world existing outside of the confines of the room. It's a very restricted work which bears every sign of its stage-bound origins. Yet the film is still hugely entertaining because it originates from such a funny, sly play. Hecht and MacArthur's dialogue crackles (and not merely because the sound quality of existing prints isn't all that great) and the cast are thoroughly game. In addition to Menjou and O'Brien, who are terrific at bringing life to the by turns fractious and begrudgingly respectful relationship between Hildy and Burns, every actor seems to be having a ball throwing out sharp quips and subtle innuendos. It also benefits from having one of the funniest punchlines in all of film comedy (one which was arguably done better in the 1974 version, which was directed by Billy Wilder and starred Walter Matthau and Jack Lemmon as Burns and Hildy, respectively). It's easy to see why the original play was so popular because it's riotous good fun, and you can also understand why it would form the basis for a number of other adaptations over the years. The greatest of these being His Girl Friday, which transformed Hildy into Rosalind Russell, in the process setting the template for every battle of the sexes romantic comedy ever made. Of the various adaptations, Milestone's is one of the weaker efforts, but it still stands as an interesting landmark in the evolution of comedy on film. It feels very much like it was made at a time when people were still figuring out how to make sound and movement work together seamlessly, in the process creating films which were dependent on script and chemistry to make up for the perfunctory execution. More than that, though, it's a testament to how much difference a great script can make. Time and technology may march on, but a good gag is a good gag.